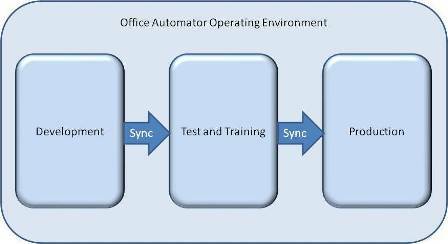 The Office Automator operating environment incorporates has the complete model of the business (or business division) and all the projects, packages, tasks and Automated Transaction Templates as well as the common content of that business such as headers, footers, standard legal disclaimers etc. a development workspace where changes to the model can be tested as the business evolves. a training and test workspace for model changes to be evaluated and users trained. Model changes can be synchronised between the three parts and data can be imported from the production workspace for test and training purposes. This allows for new business processes to developed, or existing business processes improved and tested independent of the production environment, supporting continuous process improvement.